There seems to be a lot of terminology borrowed from the aircraft industry in AWE. Some examples are sink rate, wing loading and stall speed. 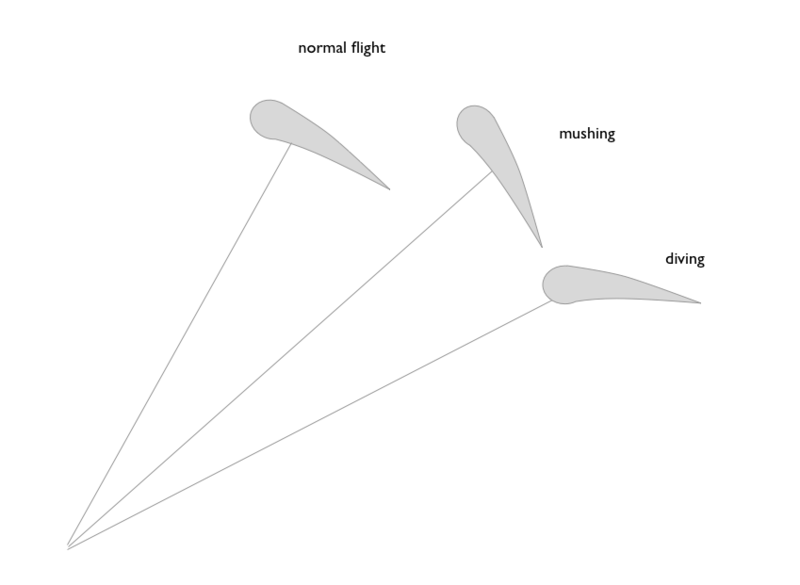 Though they do provide some insight it seems to me that kites are kind of different, and I tend to return to polar curves for analysis. I am wondering if there exists any terminology for the phenomena described below. 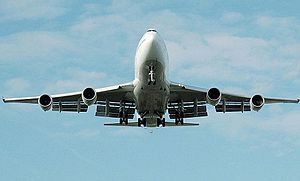 When a wing is flying at a low angle of attack [AoA], the lift-to-drag or glide number [G] will increase with increasing AoA. At a certain point, maximum G has been achieved. If we continue to increase AoA, G will decrease. What is the name of flying on “either side” of the maximum G conditions? High-lift devices like flaps slats and slots imply also a high drag, so a use of the “either side”. Such devices could also be useful for some AWES. 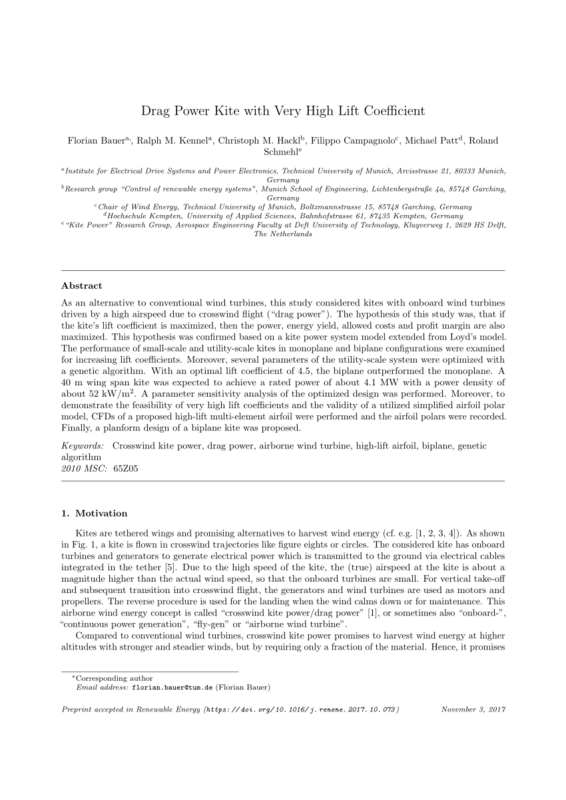 As example https://www.researchgate.net/publication/320742362_Drag_power_kite_with_very_high_lift_coefficient already discussed. I think also about some other AWES possibilities. I think for kites the tether drag should also be included in determining if you are left or right of maximum G on the plot. Anyways, I was wondering not mostly about the physics, just if this has a name, eg. flying G-upwind or G-downwind. A kite should stabilize itself at optimal G, but for dynamic movements it’s not so simple. I cannot say that I have understood all these terms correctly, the above is to the best of my knowledge. I think if you chose a wing profile, zero AoA is already defined by geometry. Lift to drag curves would use that reference. Anyways I was more looking for names to describe the conditions rather than using positive/negative AoA. 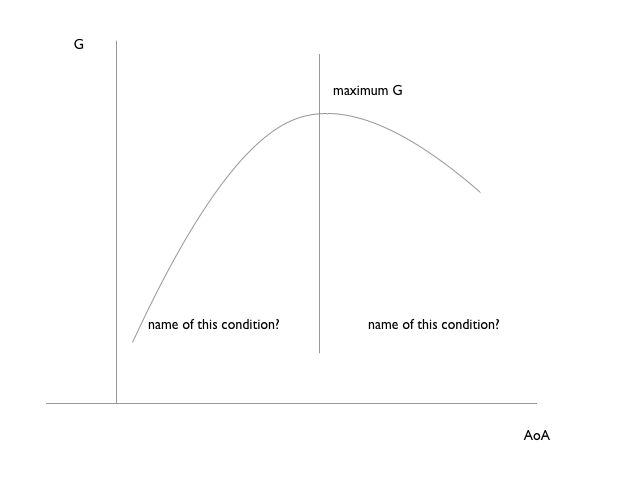 For AWE use, why not “depowered, (then) optimum L/D ratio point (or maximum G), (then) mushing.”? “Mushing” can be also the point where there is maximum pull, and is used for several AWE configurations like yoyo for static kites, but also for crosswind kites if one considers the AoA of wing is replaced with the AoA of the full swept area that is similarly tilted. So yoyo systems would use mushing (reel-out phase) and depowered (reel-in phase) points. Static kites like parachutes could use both higher lift and drag to increase pull during reel-out phase, using mushing point rather than optimum G that is used by a lifter kite. Crosswind kites will use optimum G in regard to the apparent wind, but their swept area could be tilted like a static kite in mushing position. Mushing position for static wing with high AoA or for highly tilted swept area could also be called as power position, where the elevation angle is low in order to increase the swept area and decrease the cosine loss.